The classroom of the Grand Duchesses was decoratecd with an olive-colored wallpaper and a stencilled frieze of pine cones and owls. On the floor was a sewn carpet in dark navy blue carpet. The room had a large table surrounded by chairs with footstools. Fabric depicting stylized tulips covered the chairs and was used for curtains. In the corner stood a big green-tiled Russian stove. 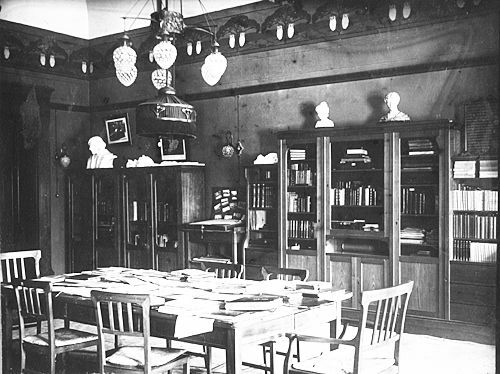 Large bookcases were filled with standard text books on serious subjects such as geology, history and mathematics. For scientific study a skull stood on top one of the big glass-doored bookcases that lined the room. From the center of the ceiling hung a large chandelier with hanging red and white-nubbed glass tear-drop shades. In the middle of the fixture hung an adjustable cloth-shaded light, which illuminated the work table. There were two classrooms for the Grand Duchesses in the palace. The second was over Nicholas's Reception Room and was used for music and dance instruction. "On the day appointed for my first lesson a royal carriage came to take me to Alexandria Cottage, where the Tsar and his family were residing. Yet in spite of the liveried coachman, the Imperial arms on the panels, and the orders with regard to my arrival which had no doubt been given, I learned to my cost that it was no easy task to enter the residence of Their Majesties. I was stopped at the park gates, and there were several minutes of discussion before I was allowed to go in. On turning a comer I soon observed two small brick buildings connected by a covered bridge. If the carriage had not stopped I should not have known I had arrived at my destination. Olga, the eldest of the Grand-Duchesses, was a girl of ten, very fair, and with sparkling, mischievous eyes and a slightly retroussŽ nose. She examined me with a look which seemed from the first moment to be searching for the weak point in my armor, but there was something so pure and frank about the child that one liked her straight off.